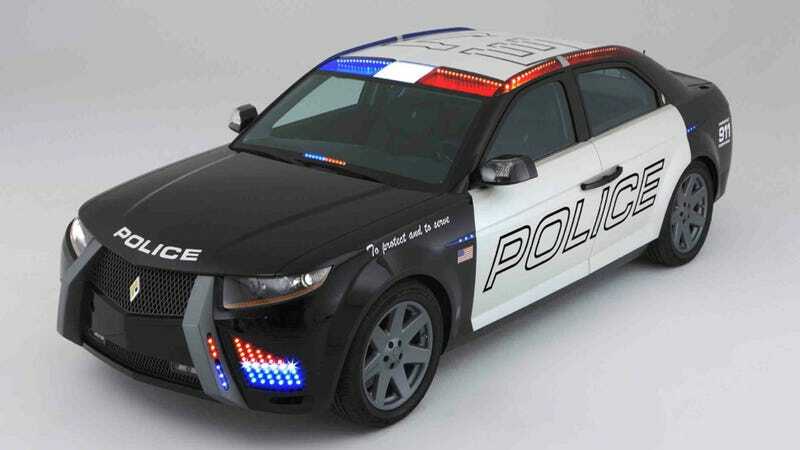 If you ever had dreams of taking the law into your own hands in Carbon Motors' BMW-powered, purpose-built police cruiser, you might just get your chance soon. A Carbon E7 prototype is about to go to auction in Indiana to help alleviate the failed company's massive debt. As the Indianapolis Star notes, whatever the E7 fetches at auction in January probably won't even come close to erasing Carbon Motors' $21.7 million debt to private vendors and investors, nor will it pay back the $7 million in grants the company was given by the city of Connersville and the state. Hilariously enough, the car going to auction is the show prototype "used to woo investors" into giving money to the now-bankrupt automaker. The E7 was one of the more interesting automotive startups to come along in recent years, but it was also one of the biggest and most expensive failures. The car was to be built from the ground up explicitly for police duty, unlike the Chargers and Explorers that are converted to police cars. It was to be powered by the stonkingly torquetastic turbodiesel inline six engine from the old BMW 335d. But earlier this year, Carbon quietly filed for bankruptcy not long after unceremoniously abandoning their Connersville plant. The company blamed their troubles, in part on getting turned down last year for a $310 million loan they sought from the U.S. Department of Energy, a loan they said they were led to believe would be approved. He compared the vehicle to a bottle of snake oil. The newspaper says that Jay Leno has already expressed interest in buying the car. The E7 going to auction is a prototype created for sales purposes not meant to be driven on public roads. No starting price has been announced. I always wanted to drive this thing, so if its future buyer is reading this: feel free to let Jalopnik know! We'd love to have a review of the E7, whether it was meant to be driven or not.